Tom Barkhuizen is looking forward to lining up against former club Blackpool. 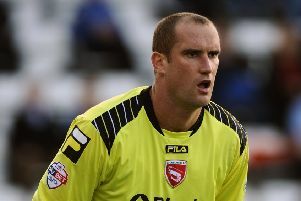 Tom Barkhuizen is relishing facing former club Blackpool in Morecambe’s opening home game of the new season. The new League 2 fixtures revealed the Shrimps will face Blackpool for the first ever time in a Football League game at the Globe Arena on Saturday, August 13. Barkhuizen swapped Blackpool for Morecambe last summer having come through the ranks at Bloomfield Road only to find first team opportunities limited. After scoring 12 goals in all competitions last term, the wide man is set to be a key man for Jim Bentley’s side this campaign. He said: “When I knew Blackpool were playing in League 2 this season this was the game I was looking out for. “To see it take place so early in the season is a cracker and a game I am looking forward to as I’m sure the supporters are too. The Shrimps kick off their season at Grimsby on August 6 before a trip to Rotherham in the first round of the league cup. Barkhuizen said: “It will definitely be a tough opening week of the season. “Grimsby will really be up for it on the opening day as it is their first game back in the Football League for a few years and they will want to get off to a winning start.